← Christmas Eve: I Passed! But I Failed! Now that you’ve got the brine made up, get your bird and gently place it in the brine solution and cover it. Place it in the refrigerator for no more than 48 hours, but leave it at least 24 hours for best results. Snip the leaves off of 4 rosemary sprigs into a small bowl. Strip the leaves off of 4 fresh thyme sprigs into the same bowl. Zest two large navel oranges and one large lemon into the same bowl. Measure two teaspoons of minced garlic into the bowl, about a teaspoon of black pepper and a little bit of salt into the bowl too. Add 4 tablespoons of grapeseed oil to this mixture. Then, mix to combine the ingredients together. Make a bed for the bird in your roasting pan of choice with the remaining orange and lemon by slicing them into rounds. Add about 4 sprigs of fresh rosemary and whatever thyme you have left to build an aromatic base for the chicken. Now, take your bird out of the fridge and remove it from the brine, making sure all the liquid is out of the cavity. Trim off any excess fat that might remain on the body. Stuff the cavity with any remaining rosemary and thyme you have, and a large lemon that you have poked a few holes in so that the juice coats the inside of the bird as it cooks. Then, put your bird in the roasting pan, breast side up. Using your hand, loosen the skin covering the breast and spread the herb-zest mixture all over the breast meat (about 2 heaping tablespoons). Then use the remainder of this mixture to spread all over the outside of the bird. 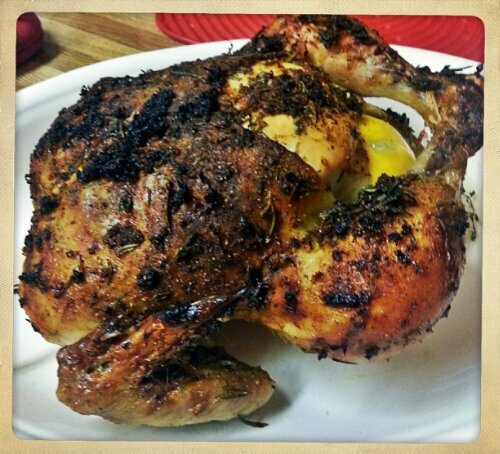 Cook the bird at 425 degrees F for 90 minutes to 2 hours or until the juices from the thigh run clear. Use a reliable meat thermometer and check the temperature of the breast meat. You want to cook it to about 170 degrees F as the temp will rise as the bird sits when it is removed from the oven and it will keep cooking. Let the bird sit for 10-15 minutes before cutting it so that the juices have a chance to settle. 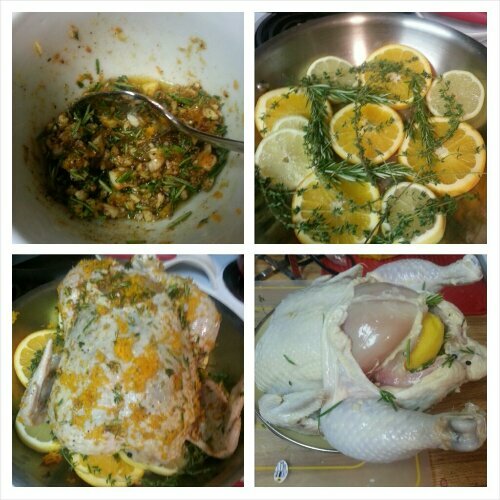 When the chicken was done, I removed it to a plate for carving, and then took the fruits and herbs out of the cavity. I also took the fruits and herbs out of the roasting pan, and made a thin sauce from the pan drippings by adding 2 cups of hot chicken stock to the pan, scraping the browned bits up off the bottom with a whisk and reducing the volume of the liquid in the pan to about half of its original volume. I also squeezed the lemon from the inside of the chicken into the pan. DELICIOUS. Zest-herb-garlic flavor mixture; citrus-herb base in the roasting pan; prepping the bird for its trip to FlavorTown; aw, yeah…bird coated in yummy seasonings! We feasted on the breast meat, and have plenty of leftovers for the next few days. I also froze the wings and carcass so that I could use them to make chicken soup in a couple of weeks. I already have a couple of chicken carcasses in the freezer to do this with. I think this weekend I will toss those others into the stock pot to make chicken chili out of…hmmm, it’s an idea! Today’s eating was much better than yesterday’s. I clamped down in a big way on carbs by keeping my carb count under 20 grams. My protein intake today was huge, at 96 grams. Tomorrow I’m planning on eating more veggies, because I miss veggies when my carbs are this low. But you know what? I got this. 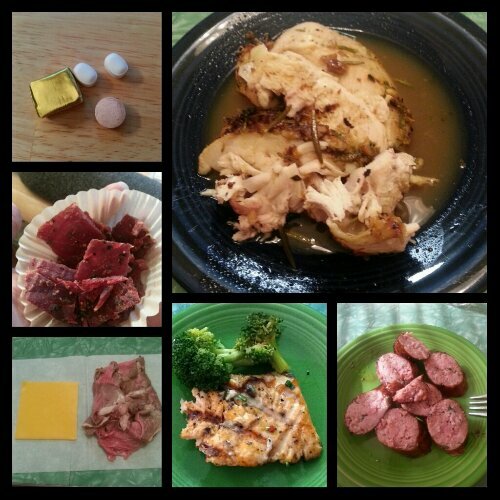 Today’s food choices, from upper right: citrus herb roasted chicken breast with pan sauce; orange rosemary sausage slices; leftover grilled salmon and steamed broccoli; Central Market house roasted roast beef and cheddar cheese slice; Jack Link’s peppered beef jerky; multivitamin and calcium supplements x2, iron supplement. This entry was posted in cooking, daily bites, eating, meal planning, planning, post-op, recipes, vsg, weight loss surgery and tagged cooking, cooking is NOT hard, daily bites, eating, healthy eating, meal planning, post-op eating, post-op life, protein, recipes, VSG, vsg realness, WLS. Bookmark the permalink.